In the religious center of Salt Lake City, the Church of Scientology takes its place on the storied South Temple street with a Grand Opening celebration on Saturday, February 17. Leading the dedication ceremony, Mr. David Miscavige, Chairman of the Board Religious Technology Center, welcomes Scientologists and guests from across the state on Saturday, February 17. Mr. Miscavige is met with thunderous applause during the inauguration ceremony held at the foot of the Wasatch and Oquirrh Mountains. Mr. Miscavige officially dedicates the Church of Scientology Salt Lake City, joined by parishioners who led the way in making the Church’s new home in Utah a 2018 reality. Among the top ten cities to live in, Salt Lake City just got even better, as a shower of confetti marks the dedication of a new Church of Scientology on South Temple. The warmth of the festive spirit fills the brisk Salt Lake air as Scientologists gather to welcome a historic moment in Utah—the Grand Opening of the city’s Church of Scientology. Warming the Utah crowd was an energetic performance of the opening anthem, “We Will Rock You,” arranged especially to encapsulate the spirit of the occasion. MR. DAVID MISCAVIGE with (left to right): Utah State Voluntary Agency Liaison, Mr. Ken Kraudy; Utah State Senator, Mrs. Margaret Dayton; Director of Operation Underground Railroad, Mrs. Taryn Dipo; and Utah Major Crime Unit, Sergeant Brandon Burgon (Ret.). Mr. Miscavige officially dedicates the Church of Scientology Salt Lake City, joined by parishioners who led the way in making Utah’s first Ideal Church of Scientology a 2018 reality. 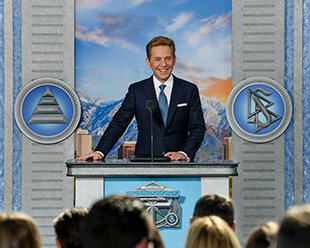 As the Church of Scientology Salt Lake City took its place on this storied street, under the majestic Wasatch Range, Mr. David Miscavige, ecclesiastical leader of the Scientology religion, welcomed the crowd. More than a thousand Scientologists and their guests gathered beneath the city’s vibrant peaks to dedicate the state’s first Ideal Church of Scientology. The opening anthem—“We Will Rock You”—embraced the backdrop, as city and state dignitaries embraced the humanitarian spirit that permeated the ceremony. Known for friendliness and community spirit, Salt Lake has already witnessed benefits from the Church’s dynamic social programs, carried out by local Scientologists and volunteers. The results have often been dramatic: legislation to protect the rights of the family from coerced drugging of children; a detox program based on L. Ron Hubbard’s groundbreaking technology that helped save lives of 100 Utah police officers exposed to methamphetamine toxins; and a Salt Lake Scientology Volunteer Minister Corps that contributed 30,000 disaster response hours in the last year alone. The Church’s gracious new 43,000-square-foot facility near the heart of the city stands as a commitment by Salt Lake’s Scientology community to social betterment within Utah. In testament to that, dignitaries from across the state came to welcome and recognize that commitment. Prominent among them were: Utah State Senator Mrs. Margaret Dayton; retired Utah Major Crime Unit Officer, Sergeant Brandon Burgon; Director of Operation Underground Railroad, Mrs. Taryn Dipo; and Utah State Voluntary Agency Liaison, Mr. Ken Kraudy. When entering the new Salt Lake City Church, visitors are provided with an introduction to Dianetics and Scientology, beginning with the Public Information Center. Its displays, containing more than 500 films in 17 languages, present the beliefs and practices of the Scientology religion and the life and legacy of Founder L. Ron Hubbard. Salt Lake City’s Chapel provides for Scientology congregational gatherings that include Sunday Services, Weddings and Naming Ceremonies, as well as a host of community-wide events such as banquets, seminars and workshops, open to members of all denominations. The Peaks Café presents a meeting place for those attending events, as well as for parishioners during breaks in their Scientology services. The Salt Lake City Church further includes dozens of specially appointed rooms providing the ideal setting for Scientology auditing (spiritual counseling). Multiple course rooms are also dedicated to training auditors (spiritual counselors), for Scientologists studying the technology of auditing, to help others attain spiritual freedom. The opening of the new Ideal Church of Scientology Salt Lake City comes during a period of massive expansion for the religion with more than 60 new Churches of Scientology from Los Angeles to Tampa, London to Milan, Tel Aviv to Tokyo and Kaohsiung to Bogotá, including 18 opened in the Western United States alone. “Ideal” is the standard set by L. Ron Hubbard so that every Church is a perfect expression of the religion’s principles and practices, including its many community outreach and humanitarian programs. In the past year, openings of new Ideal Churches of Scientology have taken place in Auckland, New Zealand; the San Fernando Valley, California; Miami, Florida; Copenhagen, Denmark; Dublin, Ireland; Birmingham, England; Amsterdam, Netherlands; and Johannesburg North, South Africa. Further Church openings are planned in 2018 in cities across Europe, Latin America, North America, Africa and Australia.